This Microphone is a multi-functional microphone that can be used on your PC, mobile phone, and the infotainment system in your car. Compared with an older model such as K068, Q9 has had some improvements that now can be connected by Bluetooth, and is compatible with various singing applications. 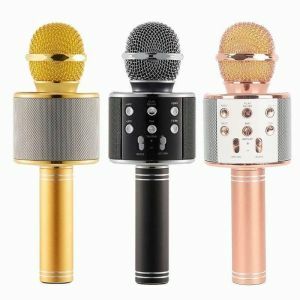 Its built-in audio has clear and vivid sound effect that you can not only listen to the music, but having fun doing karaoke anytime, anywhere. This Microphone provides a solution of the outdoor singing and speech, regardless your having a party, picnic, or any other outdoor activity. This Microphone is user-friendly that makes your activities so impressed and enjoyable anytime. It is a must-have item to have fun with your friends and families! Audio Box Size - Approx. 2.7 in. x 2.7 in. x 2.6 in. Retail Box Size - Approx. 12 in. x 5.3 in. x 3 in.